It’s a calm Wednesday evening, nearly nothing seems to be happening in South London. Some 40-50 people stand scattered inside Electric Brixton – it’s 7 p.m. and the venue has just opened its doors. But as time passes the scene starts to change, a crowd starts building up in front of the stage to listen to PAULi’s warm-up performance. By 9 p.m. the over-1700-holding concert hall is packed, and everyone is waiting for one thing to happen: Jungle. 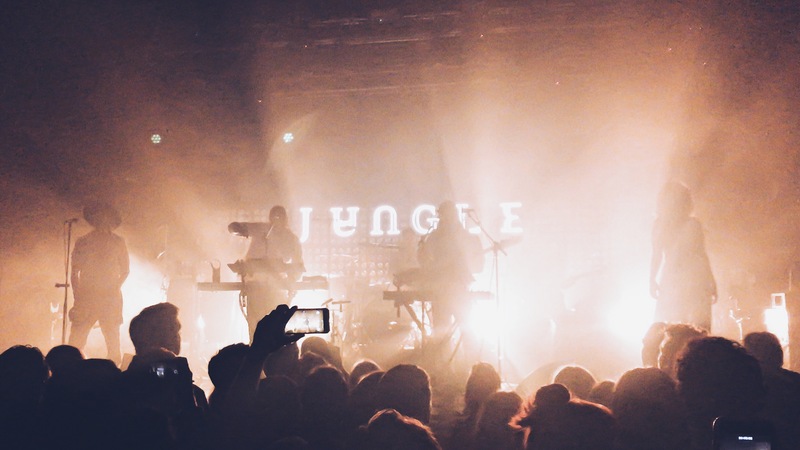 Back in 2015 Jungle, a London-based band formed not long before that, was a hit. After releasing a self-titled album in 2014 the group was securing appearances at Glastonbury, Coachella and countless other festivals; singles such as “Busy Earnin”, “Time” and “The Heat” gained high popularity, with “Busy Earnin” rising to the 19th place in the UK Indie charts, as well as being featured on the often-praised and surprisingly tasteful soundtrack of the FIFA15 videogame. However, Jungle’s genre is not purely Indie – I would call it a blend of Soul, Indie and Funk with a subtle retro tone – a mix that produces a distinctive, mellow and somewhat cosy sound, making the band stand out from the majority of other artists. The artists have been paying great attention to their music videos as well, focusing on aesthetics and detail rather than personality promotion. Visuals to their singles do not feature the band, but instead present creative choreography routines by dancers of all age, gender and ethnicity, with carefully chosen background and outfit colours. The hype about Jungle had died down since their hay-day. Ever since releasing the album, the Londoners have been completely silent on new material, performing the same over and over again for three years now. When I usually ask people if they know a band called Jungle many reply with “who?”, a few barely remember “Busy Earnin” when they hear it. Nevertheless, the band’s Facebook page still has over 160 thousand likes and the London concert, a part of a current world tour, sold out in no time. Jungle may not be as popular as they used to be, but the core fans seem to stay loyal. The concert itself was truly impressive. With live drums, bass and back-up vocals, the band’s main artists Tom McFarland and Josh Lloyd-Watson completely succeeded in translating the same mesmerising vibe on stage as they do in their records – every single note and every little rhythmical detail could be heard clearly, and the vocal performance was absolutely spot-on. In addition to that, many songs received improvised tweaks – somewhere electric guitar solos, somewhere drum-machine beat variations. One of the most interesting moments was an unexpected synth/beat bridge, leading from the song “Drops” into the notorious “Busy Earnin” (an element that is only present during live shows), which drew a wave of excitement from the crowd. A few new unreleased songs were also performed during the gig. The opener “House in L.A.”, as well as “Beat 54”, “Give Over” and “Happy Man” were not generally heard before this year’s tour. The fresh material has caused a divide between the band’s supporters so far – some enjoy it, some are so unsatisfied with it that they sell their show tickets (I got a ticket myself from a fan who thought the new songs were “trash”). Nevertheless, the additions to Jungle’s repertoire now leave fans teased and speculating whether new singles, or perhaps an entire album, is on the way. Overall, the concert was surely a good way to spend a Wednesday night. As Jungle have departed to tour the Oceania and North America, all that is left for Londoners is to wait for the next concert (or maybe for the next album? ).